Monitoring your effective rate is important and knowing how to calculate effective rate is even more important. If I could advise you on just ONE thing regarding the maintenance and upkeep of your merchant account, it would be to spend 5 minutes each month to calculate your effective rate. Notice if and how much it fluctuates from month to month. Simply put, it’s the average rate that you pay each month for the privilege of accepting credit cards at your business. It’s made up of ALL the fees, rates, charges, and monthly costs associated with your merchant account lumped into one end of the month figure. Understanding effective rate vs. any other single rate category is important when knowing how merchant accounts are charged. Don’t be concerned with how you are priced or what a specific rate is, but what your fees end up being at the end of the month. The snapshot shown below is of an actual monthly merchant account statement. You can see that the total monthly charge (all fees, rates, charges, and monthly costs) that this merchant paid is $425.32. The total card volume is $19,083.38. 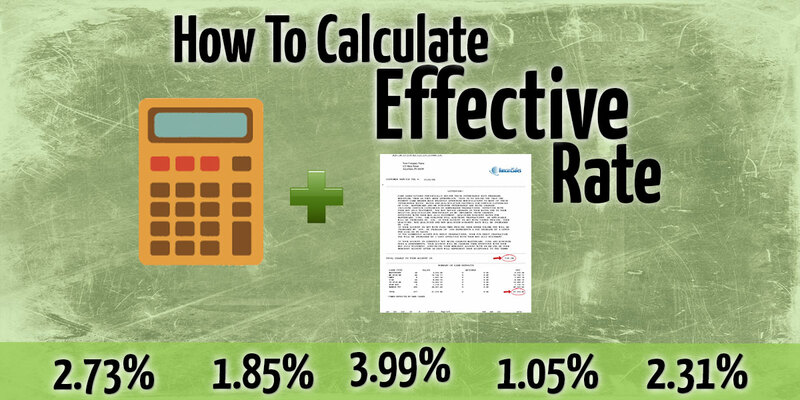 So, now that you know how to calculate the effective rate, use this calculation to determine the effective rate each month and monitor how much it fluctuates from month to month. The effective rate used as a benchmark, will give you a point of reference to compare how much your rates change over the course of time. Some accounts will change more than others based on how your account is priced (interchange plus vs. tier based program) and how you process credit cards (swiped transactions vs. over the phone or internet transactions). Knowing the effective rate will alleviate the responsibility of remembering what all the rates, transactions fees, and monthly fixed fees are or what they mean. Remember, keep it simple and do the basic calculation. If the effective rate changes substantially one month, you know to contact your merchant services provider. Advertised rates are almost NEVER equal to the effective rate. The whole reason that I advise paying attention to effective rate is that it is a true representation of the cost of your merchant account. In effort to keep you from falling victim from the smoke and mirrors games of teaser rates or introductory rates, you’ll hear me reference this consistently throughout this website. Like everyone else, I’m sure you have heard radio advertisements for mortgage companies boasting the lowest possible rates because the prime rate changed. The prime rate is always subject to change, and so are the credit card processing rates (interchange rates). It’s because of this, that you should keep an eye on your effective rate from month to month because slowly, over time, it could rise. You shouldn’t be expected to learn everything there is to know about merchant services so just pick the most important aspect and keep an eye on that. Everything else should be managed by the merchant account provider that you use.